Officially becoming an organized village in 1846, farming was the initial major industry. However, this all changed in the 1880s when coal mining became the principal industry in the area. Before long, hundreds of European immigrants came to the city to find jobs. Coal mining was thriving at the turn of the century when Staunton reached its peak population. 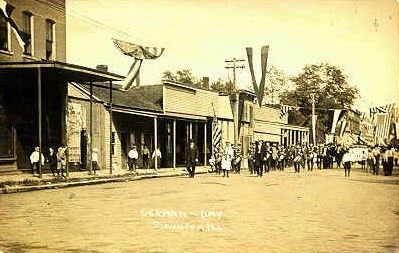 In 1910, there were four mines operating in Staunton. Though coal mining remained in the area until only recently, it began to decline many years ago. Along with it, the town’s population also declined. Today, this city of about 5,000 people provides a historic downtown district that will make you feel as if you have stepped back in time. On the 1930-40 alignment of Route 66 a must stop is Henry’s Ra66it Ranch with its sign spoofing the billboard of the Jackrabbit Trading Post in Arizona. Rabbits, rabbits and guess what? More rabbits! Yup, these loveable little critters do like to perpetuate themselves. This quirky roadside attraction and official Route 66 Landmark is owned by Rich Henry, who not only loves rabbits, but also has a passion for the dear ole’ Mother Road. Taking a trip along Route 66 several years ago, Rich noticed a lack of Route 66 visitor centers and souvenirs of the Mother Road. Wasting no time in his hometown of Staunton, Illinois, he set about to rectify that situation by adding a new attraction to Main Street USA. The question of what that attraction might be was easily solved when Rich’s daughter got a pair of rabbits and didn’t account for the resulting population explosion. Next thing you know, the Ra66it Ranch was born! However, this attraction provides much more than just rabbits. 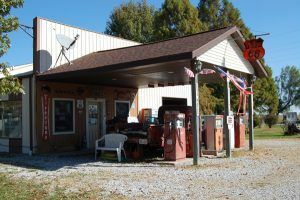 This Route 66 enthusiast has established a Visitor’s Center that looks so much like a “real” old classic filling station that the EPA asked them where the buried gas tanks were. Ha, even fooled them! Rich really had to work to convince them that there wasn’t any ground contamination and the structure was never a real gas station. Speaks well for how good of a job they did on building the Visitor’s Center. Inside you’ll find a wide array of Mother Road memorabilia, souvenirs, and collectibles. And while there, take the opportunity to talk to this Route 66 authority who enjoys sharing memories of the Mother Road with visitors from all over the world. In fact, his dad is in the Illinois Route 66 Hall of Fame at Dixie n McLean, Illinois. Outside, you’ll see the ranch itself with hundreds of rabbits, each of which has its own name and distinctive personality. 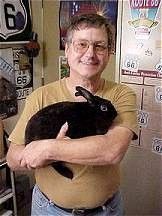 Rich has even trained some of the rabbits to do tricks for the many visitors who stop in. The Queen of the show during our visit was a rabbit named Montana – stop by and say hello. You’ll also see a collection of old Campbell’s “humpin’ to please” trailers next to the replica of the vintage station. Just south of Staunton is the old DeCamp Junction. Once a small coal mining settlement, all that’s left today is the old Riddel Store, now used as a residence and a roadhouse that got its start in 1931. The roadhouse opened as Duda’s Restaurant, the business had a dance floor and soon became a frequent stop for travelers of Route 66. It was here, in the late 1930’s, that a large black sedan pulled to stop in front of the restaurant. Within moments, several gangsters burst into the restaurant with guns drawn and ordered everyone outside. The thieves then ransacked the restaurant, stealing cash, slot machines, liquor and Duda’s private gun collection. On the next road south of DeCamp Junction is the old Riddel Store, now utilized as a residence by Lynn Puryear. Last year, Lynn purchased the land where the coal mining houses and hotel once stood and is in the process of building a turn of the century rustic village. Currently, the site holds regular flea markets, but keep your eyes open as a new Route 66 attraction is scheduled to open soon. Continuing your journey of Route 66 will soon taking you through the farming communities of Livingston and Hamel before arriving at Illinois‘ third oldest city – Edwardsville.